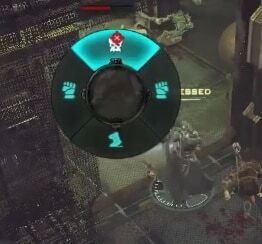 There have been a couple of gameplay videos that I have watched where the following 'screen' briefly appears. Initially I thought it had to do with an armour or grenade type that I do not personally equip. However, there have since been 2 occasions now when this 'screen' has flashed up on my screen and, to be candid I have not a clue as to what it is! So, could someone please tell me what this is please? Personally I think it is too early to decide, but having said that I think it adds flavour to the game. oh and its associated with the "aimed" abilities when you hold them down :) then you mouse in the direction of the ability you want to use. it's part of a "limb decapitation" feature. Not yet implemented. You basically choose to blow off an arm or leg :D or just shoot the head for more damage. Means you can blow a gun off of the dreadnoughts for eg.